Have to read this three more times when I finish the first time! Engaging, challenging, informative, speculative -- a wonderful read! We tell stories. We live within stories. We understand through stories. We are stories. Can we not story? One story is that we are how the universe makes meaning. What story are you living? What part do you play in others' stories? What story would you like to live? Can you change the story you are telling yourself? What's your story about God? What's God's story? What cannot be storied?This small volume, about 100 pages, will stop you in your tracks, provoke, inspire, and may help free you from the notion that you are living the "real story." I like to drink tea while I read. There is a pause between reading a passage and pouring the hot water into the teapot that David R. Loy's book is perfectly designed for. It is written in a series of provocative short quotes from notable figures and comments by David. He strings each chapter together in a loose flow of meditative thoughts that made me stop and ponder frequently. Each section unravels this great story we call reality and brings the reader/thinker into a mind-state before story. I recommend this book to philosophers, spiritual thinkers, and tea drinkers, too! This is a wonderful book; every page worthy of deeper investigation, and reflection. I read it fairly quickly, all the time knowing I'd be reading it again and again. In fact, I'm already contemplating gathering a group of friends to read and discuss this story about stories and storying.David Loy has created a new type of book with this study; rich in quotes from a diverse group of writers and thinkers, Loy then dialogues with the quilt of voices. A delightful book mostly of quotations with some explicatory transitions. Fiction as "laboratories for moral experimentation"p.63"The earth is not sacred in Abrahamic religions but God's Word is. ... Idolatry was supplanted by bibliolatry" p. 78.Like Salwak's The Wonders of Solitude, this is one of those little books nice to have close at hand for a quick browse. A short, pithy, quotation-filled book about the forms, uses, and effect of narrative(s) on human existence. The book is written from a light Buddhist perspective - fans of Wittgenstein will either be confirmed or bored by the middle half of this book. I was confirmed - hence the four stars. a reflection on the way we create and live in and through our narratives, Loy's thoughts certainly had me engaged in some deeper contemplation of meaning, story, and mystery. Brilliant. Thought-provoking. Wordy. Very wordy. Could have given it four stars or even five....but damn those words. Very interesting for most of it. Pages from about 70 to somewhere around 80 degenerated into common political shibboleths. Picked up again after. One of the most intriguing aspects of humanity is the very different way eastern and western cultures look at life. For many of us raised in the western hemisphere there's only one workable paradigm for life and that is rationalism. More precisely, scientific rationalism. When exposed to how eastern thinker envision the world we're left with a bewildered "huh?" Loy helps to make that transition a little easier.A Buddhist, Loy reflects on stories in this little book. More specifically, he argues that all life is story. Even science, apart from narrative, is nothing. We can't understand without the benefit of story. Contradictions and paradoxes abound. Instead of rushing to resolve them, we ought to be willing to ponder them. Make them part of our story. Appropriate quotations, mostly from western writers, are used to help make the spare, contemplative points he raises. I found this a most liberating book.Instead of distrusting other cultures, it is worth thinking deeply about them. I tie this to the idea of contemplation on my blog (Sects and Violence in the Ancient World) for those who are more interested in that aspect of telling the story. More meditation than narrative, this book muses on the formative role that stories have in our lives: how the stories we tell ourselves about ourselves—personal stories, cultural stories, political stories, religious stories—shape our individual and collective identities. Yes, the world is made of stories. WE are made of stories. The self is a construction, and stories are the raw material from which we build. The author, though, is a Buddhist, so he also wants us to consider that our story-constructed selves are merely artifices, and to realize one’s Buddha nature one must look beyond the self, must look beyond the source of stories to the void that is the generative source of stories, to the emptiness that is form and the form that is emptiness. 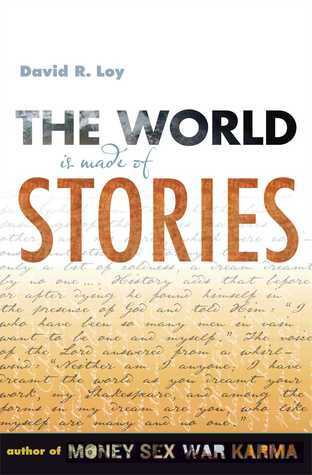 I picked up a copy of The World is Made of Stories at the Barre Center for Buddhist Studies bookstore. I've been wanting to read this for some time. It is a slim volume (my favorite kind) that is a conversation between Loy and quotes from philosophers and literary greats. It is a meandering, often stream of consciousness contemplation on the storied nature of existence. Despite being a Buddhist teacher, it's not all about Buddhism. Much reflection on politics, imagination, and Christianity too. The book is very academic yet more poetic than scholastic. It's a bit recondite at times. I suspect that will remit on a second reading. Lot's of great quotes that I can use in my teaching. This is an extraordinary book, one which I will almost certainly re-read. It is almost a themed collection of aphorisms or thoughts about how we make up our own little worlds by the stories that we tell ourselves. These short little expositions are easily and quickly read, and can really make you aware of the way that you make your own experience, potentially giving you more freedom to write a different life story. An outstanding book of aphorisms, quotes, and thoughts. Loy weaves myth, literature, Christianity, science, and Buddhism into a whole cloth that addresses some of the vexing issues between them and suggests resolutions. A delight to read. A font of wisdom from many different voices integrated around the meaning of life. The title is the best part of this book. I've read this about 6 times now and every time I get something new out of it. David R. Loy - David Robert Loy is an American author and authorized teacher in the Sanbo Kyodan lineage of Japanese Zen Buddhism.